The Bhunjia tribes are of two varieties namely Chukutia Bhunjia and Chinda Bhunjia. The term ‘Bhunjia’ means growing out of land or origin from the earth. 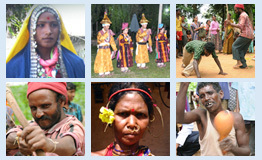 Bhunjia tribes are inhabited in the Nuapada district in the western part of Odisha. Under Nuapada there are five tehsils – Nuapada, Komna, Khariar, Sinapalli and Borden. . Sunabeda plateau is considered to be the homeland of the Bhunjia tribe. They speak Bhunjia language among themselves rather than the language of wider community. Bhunjia belongs to Indo-Aryan language family. Sunadei is their principle deity, the priest known as ‘pujari’ carries on the religious rites and ‘chhatriya’ hold umbrella at the time of worship. Community people invites traditional singer to sing in various occasions like birth, marriage and worship of Goddess. The Chukutia Bhunjia is in strict observance of the rules of ceremonial purity. The kitchen is called as ‘Lal bangla’ la:l means red, which is built by the red mud, where Chuktia Bhunjia’s cook their food, In case if any outsider (other caste) enters the inside of the kitchen even by mistake, then it is set on fire and a fresh one is built. The marriage of a brother’s son or daughter to a sister’s daughter or son is considered as the most suitable one. The men and Women wear white colour cloth in every occasion. The profession of Bhunjia tribes includes of shifting cultivation and rearing of animals such as cattle, goat, hen, cow etc. Hinduism is a common belief practice of the community. Presently, an attempt to document Bhunjia ethno linguistic profile and to produce a Chukutia Bhunjia- Odia- English dictionary, Bhunjia grammar is undergoing.